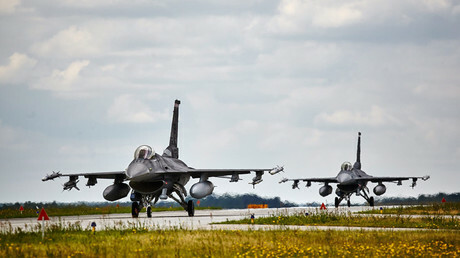 A 500-strong military contingent of NATO troops, mostly from Germany, held a farewell parade before their deployment to Lithuania as part of the bloc’s ‘Enhanced Forward Presence’ in the Baltic nation. 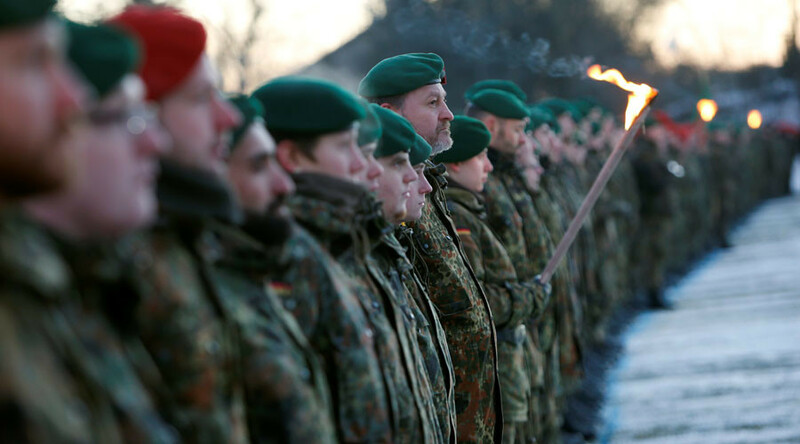 ‘Panzergrenadierbataillon 122,’ which includes 450 troops from the German armed forces and 50 more from Belgium and the Netherlands, assembled in the Bavarian town of Oberviechtach on Thursday for a farewell march before the deployment to Lithuania. The armored vehicles they are taking with them were also on display. The current NATO forces in Lithuania are to be joined by fellow soldiers from Belgium, the Netherlands and Norway by the end of February, comprising a total deployment of some 600 troops. The battalion will stay in Lithuania until July as part of NATO’s rotational force. Alongside the troops some 26 tanks and 170 other military vehicles – including Marder armored vehicles and Leopard 2 tanks – are planned to be stationed in the Baltic state, a mere 100km away from Russia’s westernmost exclave of Kaliningrad, which is squeezed between Poland and Lithuania. This “great task” appears the alliance’s “biggest reinforcement since the Cold War,” in the words of NATO Secretary General Jens Stoltenberg, aimed at deterring alleged “Russian aggression” – a term used increasingly often by NATO members. 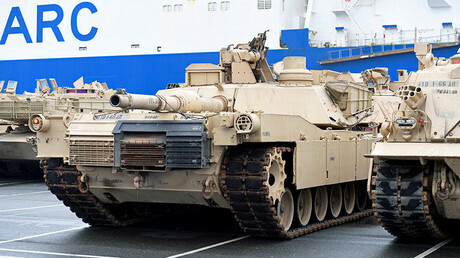 Less than two weeks ago, hundreds of American tanks, trucks, and other military equipment arrived at the German port of Bremerhaven, ready to be transported to Eastern European countries, including Poland. The delivery consisted of US Abrams tanks, Paladin artillery, Bradley fighting vehicles, and other military hardware and equipment, totaling about 2,800 pieces, all accompanied by 4,000 soldiers. The troops will soon be dispersed across Poland, the Baltic states, Bulgaria and Romania, where they’ll remain allegedly to guard Europe’s borders. The delivery marks a new phase of America’s continuous presence in Europe, dubbed ‘Operation Atlantic Resolve,’ which will now be based on a nine-month rotation. The military venture, which has been officially touted by Washington as a demonstration of “continued US commitment to the collective security of Europe,” began in April of 2014 after Crimea voted to split from Ukraine and rejoin Russia in a referendum. “Tanks do not create peace, anywhere,” Die Linke‘s Christian Görke said in a statement, as cited by RBB. “It does not help us if tanks will be going up and down on both sides of the border. I hope everyone will keep calm. I believe that despite all the difficulties, we should seek dialogue with Russia,” Dietmar Woidke, prime minister of Brandenburg federal state and Social Democratic Party (SPD) member, told RBB. However, NATO’s military moves in the Baltics were supported in the German parliament, the Bundestag, not only by members of Germany’s ruling party, but also by the Greens. Russia has denied accusations it poses a threat to Europe, claiming that NATO’s steps compromise Russia’s own territorial safety and sovereignty. Russian authorities, including the president, have repeatedly stated throughout the past year that Moscow will not stand idly by as NATO builds up its military on its doorstep. “Everything can then be deployed to the territory of this [new NATO member] – it can be missile defense systems, new NATO bases or new missile strike systems,” Putin added. “In response, we have to take countermeasures – and that means aiming our missile systems at those military objects that pose a threat to us,” the president said. In the most recent move, Russia placed mobile nuclear-capable Iskander missile systems in Kaliningrad which could reach as far as Berlin.